Starting a new hobby or routine can feel overwhelming, to say the very least. The financial commitment, the fear of failure, PLUS the idea of being the “new person” at a gym are enough to deter a lot of us. It’s a lot easier to settle in on the couch for a good Netflix binge than to take the leap and start something new. At the same time, we all have that wild voice inside...that crazy, unhinged, free spirit deep in our subconscious that is yearning for more. Maybe you’ve been perusing Instagram for a while admiring videos of Aerialists and Acrobats thinking “Hmmm...that looks fun”. Conditioning: Don't Fake It, and You'll Make It! 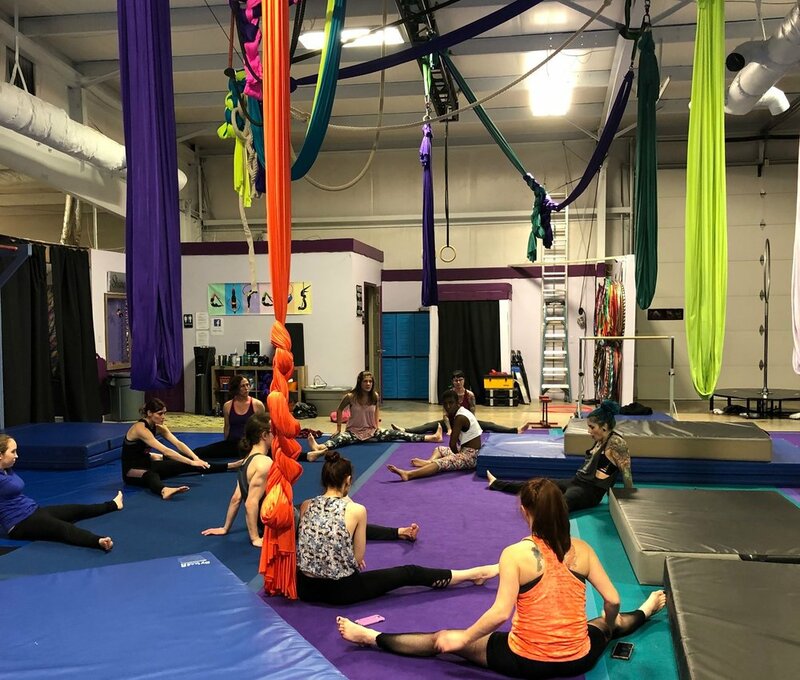 Want to train with the circus? We welcome you with open arms! The circus community stands out for being accepting and diverse. People start their circus journey from a variety of backgrounds, developing their own voices and strengths in the process. You don’t have to come from an athletic background to get started. That being said...get ready to be whipped into shape! Most circus skills require a lot of practice, coordination, body awareness and control, strength, and flexibility. You can start developing these skills from anywhere, and it’s our job as teachers to personalize classes and advice to fit your needs. We are willing to work with you wherever you’re at to help you progress and find joy in the process. And you will! BUT...you have to put in the work. Like most things in life that make you truly happy, circus skills do not come easily. Even if you climbed confidently on your first day in aerial silks class, chances are you practiced those skills in previous activities. And some people just have a raw, natural talent, and that’s amazing! But it’s not enough just to land a difficult trick. Can your body truly support you doing that trick for long periods of time, under stress and in any setting? At ACA, we want you to answer “yes” to that question - and that is why we build conditioning exercises into all of our classes. While you definitely don’t need a certain “body type” to do these skills safely and confidently, you DO need to be working at your best for your body. That means you may be learning fewer tricks in each class, but working consistently on the strength, flexibility, technique, stamina, and mental breakdown of each one. That takes time and patience, but it’s a more sustainable way to practice. We hear this question all the time - how can you condition on your own time, and what should you focus on? What should your typical practice look like? I’m a firm believer in good old-fashioned drills. When I started hoop dancing, I spent many practice sessions just drilling waist hooping and practicing isolations in the mirror. It doesn’t feel graceful at first, but gradually you will develop muscle memory and clean technique, and the repetition helps you fully understand the trick - and not just the first day you learn it. Your mind may get it, but your body needs time and practice to catch up! Listen to your body when planning your workouts. Remember that in a set of exercises, increasing reps of the exercise will work your endurance, while fewer reps of a more challenging exercise will increase your strength. When stretching, find a “comfortable edge” and try to stay there for at least 30 seconds to a minute for best results. Make sure to warm up before you condition and cool down afterwards - your body needs time to build up and wind down from all the work you are doing! In our studio classes, we will give you several exercises and conditioning tips to work on. We also have a great video on our social media pages with details for an at-home workout. Be sure to check out our Stretch & Flex and Aerial Strength and Conditioning classes (all levels!) for deeper work on strengthening and mobility. We will continue to post exercises and ideas, but we encourage you to use all the fitness resources available out there to design a routine that works best for you!